Releasing the Magic! : THE 'MADE IN SHEFFIELD' ENGINEERING STRAND.... PASS IT ON! THE 'MADE IN SHEFFIELD' ENGINEERING STRAND.... PASS IT ON! While I was in Sheffield today, I also met with colleagues from the schools working on the engineering/advanced manufacturing strand of the Cutlers’ “Made in Sheffield’ Programme. These schools are Bradfield School, Firth Park Community College, Handsworth Grange School, Stocksbridge High School, Westfield School and Yewlands Academy. We met at the Cutlers Hall to review the programme with John Barber from the Workwise Foundation which runs the programme for the Cutlers Company. The programme places an emphasis on developing a world class generic skills framework while providing a rich and varied menu of opportunities powerfully connecting the students learning to the engineering and advanced manufacturing sector. The Cutlers’ “Made in Sheffield” Ambassadors experience a radically different work related programme with direct experience of the advanced engineering and manufacturing sectors. 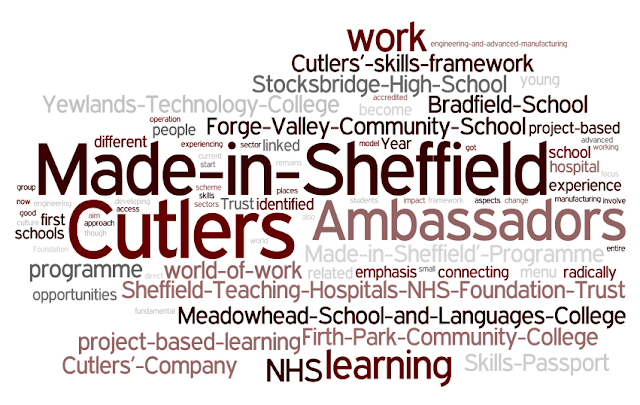 The programme has got off to a brilliant start this year but we recognise that the scheme must impact on the entire school with all students having access to learning which develops the Cutlers’ “Made in Sheffield” Skills which are essential for helping young people make the best possible start in the world of work, enterprise and opportunity.